Explore the greatest art from five decades of Marvel's Guardians of the Galaxy comics with this deluxe art book. 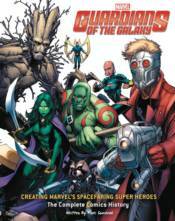 The Guardians of the Galaxy made their first appearance in the pages of Marvel Super-Heroes back in 1969, and while the team's lineup has changed significantly over the years, its popularity with fans has continued to grow and grow. This deluxe book delves into the creation and evolution of the Guardians through exclusive interviews with the writers and artists who have brought them to life.